• New Feature in Wave Editor (TrackExpress or Trackprocessor): Relative Time Display and Relative Time Axis for current selected Track. • New Feature in Wave Editor: While Moving Track Start or Track Stop a Live Time Display is shown. So you can see chaning Start,Stop,Length of the selected Track. This works for normal Track Express Wizard and manual Trackprocessor Mode. • Improved: The Auto Rewind Function for Editor/Playback Mode and Track Wizard can be configured at Settings Page Audio Options. Default=disabled. If disabled then the playback position stops at end of selection or end of title and there is no auto rewind performed. This is a helpful feature for manual Track Editing in the Editor. • Improved: Manual Editing Tracks, an obsolete dialog choice step (move/split track start/stop) has been removed. 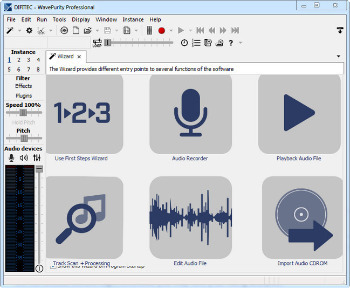 • Improved: Manual Editing Tracks, Track Start/Stop Movement with overlapping and parallel pressing CTRL key performs a movement of the track border between current and next/previous Track. • Improved: Trackprocessor, The Input Dialog for Song Title Informationen and Filenames has been improved. Pressing ENTER in a dialog field forces a fast goto next field or next Track. • Improved: Track Express Wizard is a docked Window in the Editor now. Optional you can choose/change the old Tool Window Layout for the Track Express Wizard. • Improved: Track Express Wizard Tool Windows will be shown/hidden in context of current Tab/Editor. So only one Track Express Wizard is visible at same time. • Improved: Trackprocessor, Target Directory is editable Field now and checks if Directory exists. An additional button “Create Directory” helps you to fast create a folder. • Improved: Trackprocessor, Save Session can be optional activated/disabled by a checkbox if current profile has general enabled the “Save Session” feature. • Improved: Editor Speed Conversion, now you can choose between Percent or BPM. • Change: Default Window Size to 1250×750. • Change: Start of Registration Process, now the Default System WEB Browser is opened. • Bugfix: Extra Insert/Overlay clipboard, The Length of insertion/overlay has been fixed. • Bugfix: CDDB Query Tool, removed Script Error Windows. • Some minor improvements and fixes.